Hand-stitched dad and I are notorious for our decision making skills. We like to sit with the question, weighing up an endless supply of ‘what ifs’ and second-guessing what we (and others) want. Social workers love that we took our precious time (three years in fact) between our first enquiry and our decision to proceed. They will love it less when waiting for our answers during home study, I’m sure. The government was not thinking of me and hand-stitched dad when they decided to reduce the assessment period to eight, six and then four months. We genuinely need time to process and adapt to what we learn about adoption and about ourselves. We are thoughtful and considerate people. We are not good at making decisions. Age? Not an exclusion factor. The social worker from Rural Adoption Agency pointed out to us that we needed limits, otherwise we would have thousands of children thrown at us once approved. We looked up BAAF’s matching criteria form and discovered we still couldn’t draw a line. “You need to talk about it more.” The social worker suggested. I thought to myself: we’ve talked about it plenty; what we need is a way to make decisions. Based on my own experience of trauma and neglect, the last thing I wanted to hear as a child was that I’d been chosen. I would much rather have had a choice. I would have wanted someone listening to me and giving me a say in the decisions. It’s not easy getting to know a traumatised child on that level. But that doesn’t mean it shouldn’t be done. Where on the BAAF form does it say: “I would like the child who would choose me” ? We babbled excitedly about Rural Adoption Agency. I was pleasantly surprised by some of what the social worker described. It fit my impression of the agency from my research and monitoring. It’s nice when evidence corroborates like that. We looked into each other’s eyes and our smiles grew. We bounced up and down together, both exclaiming in unison: “We just made a decision. We just made a decision!! !” Then we collapsed in fits of giggles at our absurdity. We smiled at each other. We held hands. Hand-stitched dad and I have a lot of big emotions around adopting. Excitement for working even more closely together as parents. Anticipation over who might join our family. Frustration that so much is in the hands of other people. Fear that we might be deemed ‘not good enough’ to be adoptive parents. Anger at people for withholding or limiting support for adopted children. Empathy for birth parents who struggle with the chaos of their lives. Sadness over our shared losses: the children, their birth parents and us. Admiration for the remarkable people who find security despite traumatic experiences. Hope that we can be a family that belongs somewhere, together. Amidst all these emotions (and more) are important details and decisions. So, I started a Blue Notebook as a communication record, filled with dates, names, phone numbers, and notes of conversations and meetings related to the adoption process. As I told the social workers: unlike many people beginning this journey, we are not in a hurry. Adoption thrives on preparation. After spending the last few years in books, blogs and forums, we are starting to branch out into telephone calls, meetings, and visits. Once we apply to an agency, we will join a preparation group and meet other prospective adopters. We will have home study visits with a social worker (or two), who simultaneously educates and evaluates us. Then, when we all agree we are ready, we go to panel to be approved (or rejected) as adoptive parents. I genuinely hope this takes time. I want time to build my confidence as a therapeutic parent. I want time to make decisions about what sort of children hand-stitched dad and I are best suited for. 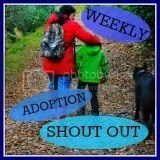 I want time to build new relationships with experienced adopters, with our chosen agency, and with other new families. We need time to manage all of the big emotions that are stirred up in this process.